There’s a whole lot of noise coming from this lot of trigger happy Italians. 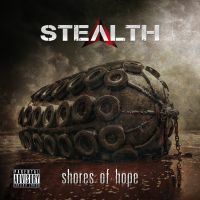 The only trouble is that noise is the only thing genuinely intoxicating about “Shores of Hope”. “Guns! Guns! Guns!” is a promising opener, a combination of dirty grooves and modern hard rock kicks. And it’s the kicks that turn into jelly as soon as “The Border” exits the room. The band has trouble walking the steady line if indeed style changes offer a variety of unexpected twists. “Rock Beast”, as the title suggests, is soaked to the bone with 80’s hard rock extravaganza, while on the other side “Ozone Fades” shines a grunge infected gloomy atmosphere. “Uhlans, 1915” is a fine enough ballad still it’s fairly tepid stuff. The same goes for Enrico Ghirelli’s vocal delivery, which ain’t exactly fluid or expressive. Still judging by the sheer indifference of the material, vocal maladies rank among those less annoying of Stealth’s headaches. With rare exceptions, “Shores of Hope” is a toss up that best embodies the disarray of a whole generation of young bands.